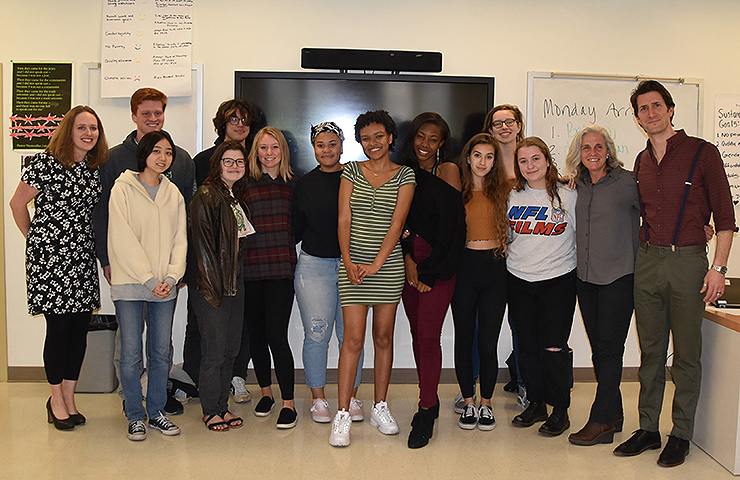 More than twenty students collaborated on the winning film, "Power in a Whisper, Rodney Glasgow," which will be screened at the Tribeca Film Festival on Sunday, May 5. The grand prize winner, Power in a Whisper, Rodney Glasgow, a film by Julia Carrigan ’20, will be screened at the Tribeca Film Festival in May. The judges this year were Kerry Kennedy, president of RFK Human Rights, and actors Keegan-Michael Key, Alfie Woodward, and Matt McCoy. They were impressed with the value, quality, writing, and substance of Julia’s film. The competition received 1,000 entries this year, and only one hundred made the final round, four of which belonged to George School. While Julia’s film was the grand prize winner, the judges sent along admiration for the other student films as well. Chris Chan ’19 made a film about Emma Schneider ’19 and her work fighting against gun violence. Jalsa Drinkard ’20 directed a film featuring Jacqueline Evans and her work fighting against the PennEast Pipeline, and Prabh Kaur’s ’20 film featured Jill Loyden’s work combating domestic violence. Power in a Whisper, Rodney Glasgow, will be screened at the Tribeca Film Festival on Sunday, May 5. The screening is free and open to the public. Film credits: Cinematography: John Fort ’19; Assistant Camera: Walter Owino Wagude ’20; Sound: Digital Juice, Sahib Singh ’21; Assistant Sound: Crystal Rowell ’21; Starring: Rodney Glasgow, Jalsa Drinkard ’20; Featuring: Rohan Arjun ’05, Rebecca Missonis, Meredith Alford ’01, Maddie Keith ’19; Research Team: Miranda Buczek ’19, Will Rampe ’20, Alice Yang ’19, Faith Friendshuh ’20, Rachel Brown ’20, Ava Doty ’20, Lexie Osbourne ’20, Kate Levesque ’20, Julia Carriagan ’20; Writing Team: Jalsa Drinkard ’20, Jayde Dieu ’20, Aiknoor Kaur ’20, Walter Owino Wagude ’20, Eden Jones ’20, TK Mpela ’20, Sam Coscia ’20, Spencer Stockhammer ’20, Raven Zhang ’20, Julia Carrigan ’20, Melaina Young ’93; Extras: Shumpei Chosa ’19, Isaac Lee ’19, Frederic Perera ’21; Prabhnoor Kaur ’20, Lauren Scott ’20, Shaina Gonzalez ’19, Chris Chan ’19, Julia Carrigan ’20, John Fort ’19.